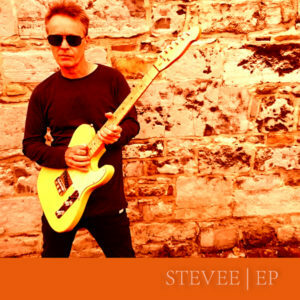 Born in London Stevee is a songwriter and guitarist now based in Moscow, Russia, a pretty unlikely place for a British indie rock artist. However, Moscow has a thriving rock scene and by dint of being British Stevee benefits from a certain cachet and authenticity. 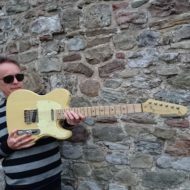 His influences range from 60s bands such as The Beatles, The Stones, and The Kinks to artists such as Johnny Marr, Paul Weller, Blur and The Clash. Stevee’s sound is British and his latest release is an EP titled STEVEE. STEVEE, an eponymous 4-track EP, features an interesting mix of styles. The opener, A Little Alien, (Play NOW in the player in the sidebar) is a classic piece of indie rock somewhat reminiscent of Radiohead. Lyrics, upfront and clear in the mix, are a feature of STEVEE songs. The next song, Some of the Parts, is lyrically very strong and philosophises on the transience of things. The third tune, How We Burn, sails close to the jazzy side with a trumpet solo and reverb-drenched guitars. It will tug at your heart strings with its tale of regret for lost love. The EP closes with a rousing, feel-good number, To the Park – upbeat pop with a fun story taking in love, ice-cream, ducks and London parks on a summer’s day. Released on Bandcamp, iTunes, Amazon, Spotify and all major digital stores. Best deal on Bandcamp – Get it FREE!